This article is from my husband’s Fitness & Health blog. It brings a tear to my eye. I am so very proud of him. Please read. I have to share the experience that I participated in yesterday. An experience of sharing, victory, joy, triumph, camaraderie, motivation and inspiration. I recently took up road biking as an addition to my workout routine. It gives me a chance to relive a childhood of bicycling and some excellent exercise as well. Last month on my 50th birthday, I decided to ride a mile for each year of my life. What an accomplishment I felt I had achieved. Little did I know where it would lead me. 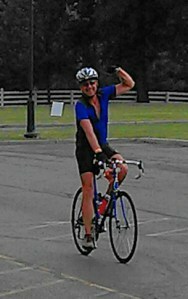 My wife brought home a flyer for a fund raising ride to battle Multiple Sclerosis. (MS). It gave an option of a 30, 50, or 95 mile ride. I thought the chance to raise funds to help others would be a great opportunity for me to give as well.